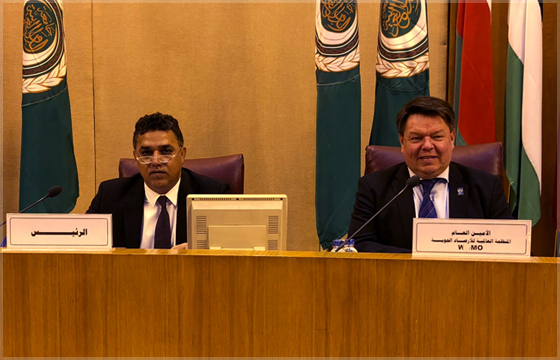 Cairo, April 26 - His Excellency Dr. Abdullah Al-Mandous, Director of the National Center of Meteorology, inaugurated the second session of the Council of Arab Ministers for Meteorology, which was held today at the headquarters of the General Secretariat of the Arab League in Cairo. In his opening speech, Al-Mandous stressed the importance of the item on the development of the Integrated Strategy for the Arab Meteorological Services and its Plan of Implementation (2020-2030) because of its new addition that will push the Council forward. For his part, Dr. Khalil Al-Thaqafi, Chairman of the General Authority for Meteorology and Environmental Protection in the Kingdom of Saudi Arabia, praised the efforts exerted by the UAE during its presidency of the Council during the past two years. Coordination among Arab countries, cooperation and exchange of experience in the field of meteorology as well as the magnitude of the challenges resulting from climatic conditions and the increased threats from climate events. He called for the development of the meteorological sector to meet these challenges, stressing the importance of the topics discussed by the Council today and expressing the hope that it will positively reflect the aspirations of the peoples of the region. For his part, Gamal Jaballah, Director of the Department of Environment and Sustainable Development at the League of Arab States, said that the Arab nation is facing a very important challenge as the economic and political developments and conditions, as well as the natural disasters and weather changes exacerbated by the storms and air storms, heavy rain and severe drought, The changes that have taken place in the Arab region, the support of the Meteorological Commission for the development of telecommunications, human development mechanisms and the development of meteorological facilities. He added - in the speech of the Secretariat during the opening session of the Council - that climate change is one of the most important current challenges in the Arab region due to the consequences of those climatic conditions on the Arab region. He stressed the importance of activating sustainable development plans and laying down the foundations and plans for tackling climate change, strategies and activities within the framework of the Arab Plan of Action to adapt to the climatic climate with the application of international air standards and the international navigation plan in cooperation with the International Meteorological Organization. The meeting discussed a number of items, including aeronautical meteorological services, awareness and information on meteorological services, weather and climate risk information management, training and capacity building, and the Arab Climate Outlook Forum. The meeting also discussed the integrated strategy of the Arab meteorological services and its executive plan / 2020-2030 / and follow up the cooperation with the World Meteorological Organization and the relevant Arab, regional and international organizations, cooperation with regional groupings and countries within the framework of the forums and updating and developing the work of the Council.